This course is ideally suited to newly appointed and potential team leaders / supervisors. Any employee making the change from team member to leader / supervisor faces a challenge of adjustment and this programme will aid them in that transition, enhance their skills, knowledge and confidence and enable the business to have the whole programme funded through the Apprenticeship Levy. 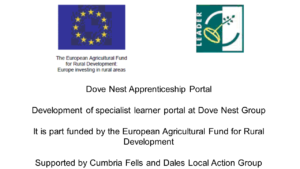 The Dove Nest level Three programme provides a blend of coaching, self-guided learning, a work-place project, and experiential activities, culminating in an internationally recognised qualification, practical knowledge and tools to help the newly appointed supervisor and a skill set that benefits the organisation over the long term. A range of essential management skills applied and refined in a real working environment. The leadership capability to motivate teams and influence with confidence. and support growth and performance. Taking real examples direct from their day to day work, candidates develop a project which addresses current issues / opportunities for the business, whilst also creating opportunities for individual learning, to develop new skills and expertise. Existing organisational competency frameworks can be weaved into the fabric of the programme, thus tailoring the material specifically for both the candidate and the organisation. Delivering, at the same time, a learning experience in line with the organisation competencies, and also a robust accredited qualification. Scheduled updates between candidates and their workplace manager / mentor. This ensures continued progress, connecting the candidate learning directly with the workplace context and ensuring the organisation can document the programme sufficient to support the levy funding. Skills and expertise are not enough to ensure that the highest learning achievements translate into the working environment. Behaviours, values and competencies are essential to successful practice within the organisation. Dove Nest Modules specifically include experiential learning exercises ensure that learning and skills acquisition is both practical and theoretical, creating lasting transformational change.